Tweeted about this a little while ago, but I’m so excited for this book that it deserves a blog post! 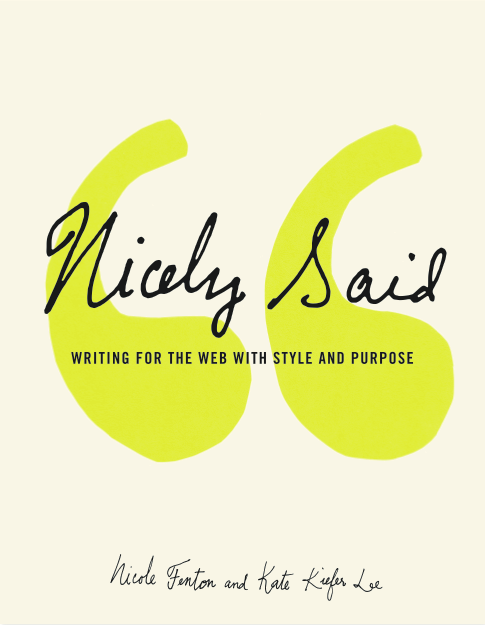 Writer/editors Nicole Fenton and Kate Kiefer Lee teamed up to write Nicely Said: Writing for the Web with Style and Purpose, which will be published in June 2014. Nicole has partnered with a variety of clients on writing and content strategy projects, and Kate worked on arguably the most kickass Voice & Tone document ever (is there a chapter on proper use of hyperbole?). Writing short, clear, empathetic copy is a subtle art, and the way a website sounds is just as important as how it looks (especially when things go “wrong”). I’m not sure I personally know anyone who had a writing course in their design program, so I can imagine that books such as Nicely Said are valuable to quite a few web designers. If you’d like to pre-order this manual on solid web writing, you can do so on Amazon or Barnes & Noble.